We'll arrive early in the morning to Bangkok, Thailand's capital city. The day is free to explore the many sights of Bangkok. The Grand Palace, Wat Pho, National Museum, and Jim Thompson's House are just a few suggestions. A trip along the Chao Praya river and through the canals (or klongs) gives you a different perspective of daily life in this busy city. In the evening, we'll say good bye and enjoy a Thai meal and perhaps a beer together to celebrate the end of an amazing journey. Only ground transport Local bus, air-conditioned bus, train, walking, tuk-tuk, local boat, junk boat, plane. THAILAND As the popularity of train travel in Thailand continues to grow domestically, some of the routes used on this tour do not have sufficient space during local public holidays, including New Year’s, Songkran, etc. 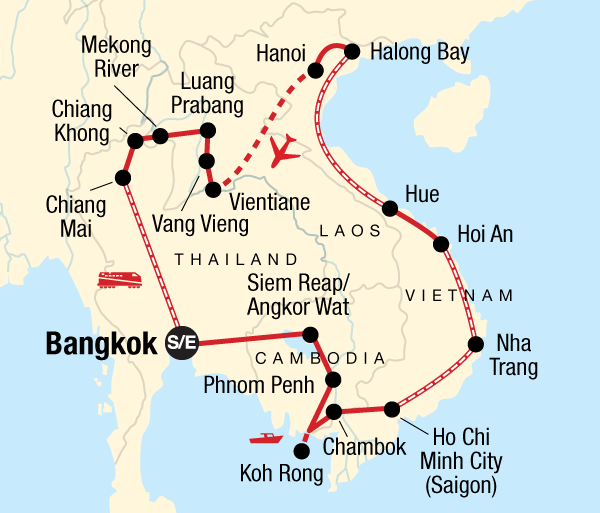 During these times of the year, alternative transport may be arranged for one or more of the train journeys within Thailand on this tour. VIETNAM Train travel in Vietnam is very basic and train cleanliness is often not a priority for train staff. Sleeper trains normally have 4 seats per compartment, which convert into sleeping bunks (two upper and two lower). A sheet, pillow and blanket are provided, although many people prefer to bring their own sleeping sheet. At times, passengers of different genders may be required to share a sleeper train berth and/or share a compartment with people not travelling in your group. Simple food is available on the train but many people like to stock up on freshly baked bread, cheese and fruit prior to departure. Water should also be bought before the journey. Train journeys in Vietnam are an experience and allow you to get a real taste of Vietnam. 1. 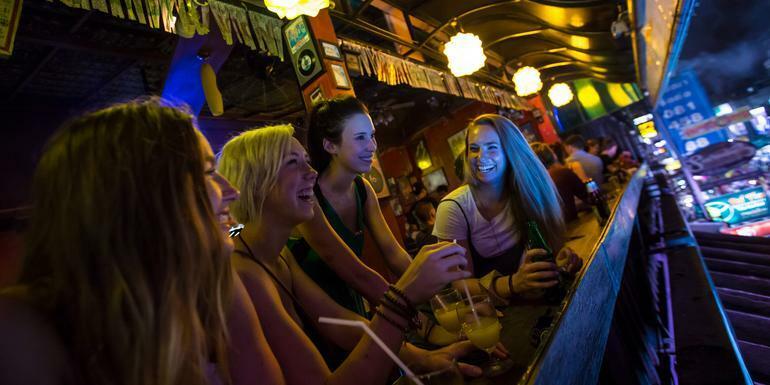 EXTRA ACCOMMODATION AT THE BANGKOKIANS If your tour begins or ends at the Bangkokians City Garden Hotel, and you are looking to add nights before or after the tour, the extra accommodation will be located at Hotel De Bangkok. Hotel De Bangkok is an affiliate hotel of the Bangkokians, and the two properties are right next to each other. If you are interested in adding extra nights of accommodation to compliment your tour, please reach out to our GCO Sales team who will happily add this service to your booking. 2. COMBO TRIP Please note that this trip is a combination of multiple G Adventures tours. As such, the staff and/or particular vehicles operating your tour may change between tour segments. You may also expect some group members to join or leave the tour, between tour segments. Also note that in some major cities in Vietnam, many hotel rooms do not have windows. 3. BORDER CROSSINGS Aranyapathet, Thailand to Poipet, Cambodia - Thailand to Cambodia Bavet, Cambodia to Mok Bai, Vietnam - Cambodia to Vietnam* Ban Houayxay, Laos to Chiang Khong, Thailand - Laos to Thailand 4. WEIGHT RESTRICTION There may be a weight restriction for the internal flight on this tour. Each passenger is allowed to carry one checked bag with a maximum weight of 20kg (44lbs). Additional bags or excess weight charges may apply. These charges are the responsibility of the passengers.